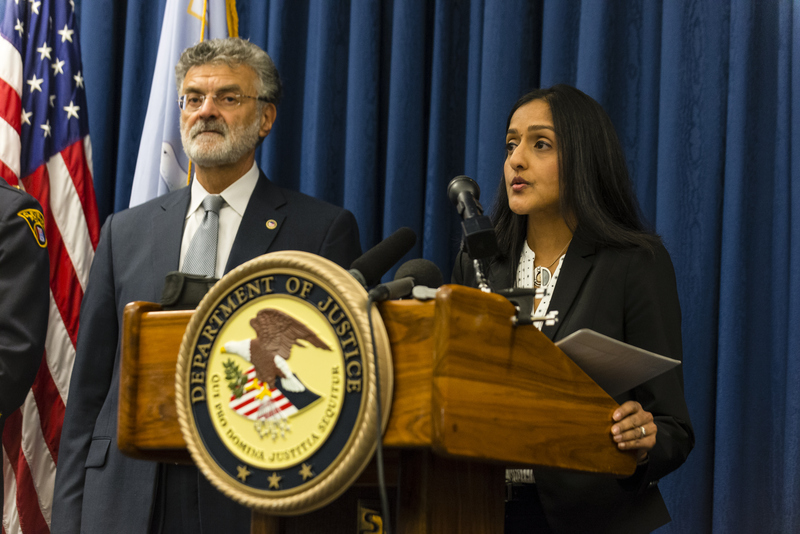 After days of protest in the streets of Cleveland and a two year-long investigation into allegations of misconduct, the U.S. Justice Department finally agreed on a settlement with city police. In a statement to the press on Tuesday following a Cuyahoga County judge's decision to acquit Officer Michael Brelo of all charges in relation to the 2012 shootings of two unarmed citizens, Assistant Attorney General Vanita Gupta announced a list of federal mandates with which the Cleveland Police Department would be required to adhere in order to overhaul what they called a "pattern or practice ... in violation of the Fourth Amendment." "Today, Cleveland demonstrates to the rest of the country that people can come together across perceived differences to realize a common vision of a safer, more just city," said Gupta, citing the Justice Department report, which was released in December. In the conclusive report, authorities detailed multiple problematic findings, including several instances of excessive force — such as the shooting deaths of Timothy Russell and Malissa Williams, as well as several other accounts of police allegedly and unnecessarily firing at suspects or physically hitting or kicking them — and employment of "poor and dangerous tactics" which placed officers in situations where they could have potentially put citizens in harm's way. In order to combat possible misconduct, the Justice Department rolled out several new requirements on Tuesday, including "reforms in the way that CDP recruits, selects, guides, trains, supervises, investigates and disciplines officers" in order to increase accountability, and "an effective employee assistance program that provides officers ready access to the mental health and support resources necessary to facilitate effective and constitutional policing." "If we don’t ensure that our officers and our community have a better relationship, then a lot of what we’re trying to implement now in terms of this agreement are going to be hard to do," said Police Chief Calvin Williams in a statement to reporters. "We have to have that relationship with our community." The settlement follows similar orders in embattled cities like Ferguson, Missouri, where police officer Darren Wilson shot down unarmed black teen Michael Brown in August 2014. After a panel of jurors declined to indict Wilson on murder charges in November, Justice Department officials stepped in to conduct a wide-scale investigation of allegations concerning racial profiling and police misconduct. They later released their findings in a scathing report on March 4, 2015. The report listed, among other things, a similar charge of aggressive police misconduct in violation of citizens' Fourth Amendment rights, as well as numerous allegations of institutionalized racism, which were later supported by the released of several racist emails between government workers in the court and justice system. An earlier mandate by federal officials that Ferguson police wear proper identification credentials was allegedly ignored, according to a report by Slate, but discussions of department overhauls are ongoing and officials hope to improve community relations soon. In other cities where Justice Department mandates have been instated for some time, feelings have changed — gradually, but definitively nonetheless. "Now it is different — it is better," said East Haven, Connecticut, store owner Marcia Chacon, in an interview with The St. Louis Dispatch in April. The city of East Haven had previously been plagued with widespread problems of racial profiling of immigrants and unrest between the large Hispanic community and local police, but in 2013, a Justice Department mandate began changing things for the better. After an in-depth investigation revealed a pattern of routine discrimination among officers, overhauls were implemented and four department members were arrested on civil rights violations. Immediately following the report's release, Justice Department officials appointed a new police chief and an independent monitor ("joint compliance expert") to keep track of the ongoing status of police cooperation. "From the moment the [joint compliance expert] started, she had a way of working well with both sides," said Civil Division Chief John Hughes of the U.S. attorney's office, in an interview with the Post-Dispatch. "She wasn’t considered a DOJ person, she wasn’t considered East Haven’s person, and both sides could talk to her independently." Hughes also concluded that the relationship between the community and police had also improved drastically. As officials in Cleveland work to enact modifications within the city's justice system, naysayers must look to those who have gone before them in an effort to work in harmony with community members to see the positives of their mandated changes — or else risk losing touch with those they've been charged to protect. "We have to have a better relationship with our community," said Williams on Tuesday. "And we’ve started on that path already."